Today I presented at the SDN conference about getting started with automated testing with Visual Studio 2012 and Team Foundation Server 2012. I want to thank the attendees for visiting my session. The slidedeck is available here: SDN 201306 – Fokko Veegens – Geautomatiseerd testen. 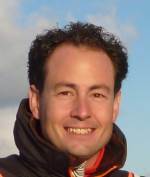 I will speak about customizing TFS 2012 at the Microsoft TechDays 2013 The Netherlands (http://www.techdays.nl). After the session, the slidedeck will be available for download on this blog. If you have any questions about my talk, please visit the Delta-N stand afterwards, I will be available there to answer them. See you at TechDays 2013! At this year’s SDN event I talked about Improving Quality with Visual Studio 2012 and Team Foundation Server 2012. My slidedeck is available for download at https://veegens.files.wordpress.com/2012/12/sdn-improving-quality-with-vs-2012-and-tfs-20121.pdf. Thanks for attending! This is part 3 of the series about importing Work Items into TFS 2010 using the Excel Add-in. For more information about the Excel Add-in for TFS, check out http://msdn.microsoft.com/en-us/library/dd286627.aspx. In this case it seems quite obvious what went wrong, a “strange” character is visible in the “Title” field. This character appears to be the control character for Form Feed/Page Break (ASCII 12). The Excel/TFS integration cannot cope with these characters. During the import I also ran into problems with ASCII characters 26 (Substitute/Ctrl+z) and 27 (Escape). Probably these characters came in by copy-pasting from MS Word. Scroll down and expand the “ASCII non-printing control characters chart” link. It will show all control characters. This is part 2 of the series about importing Work Items into TFS 2010 using the Excel Add-in. For more information about the Excel Add-in for TFS, check out http://msdn.microsoft.com/en-us/library/dd286627.aspx. 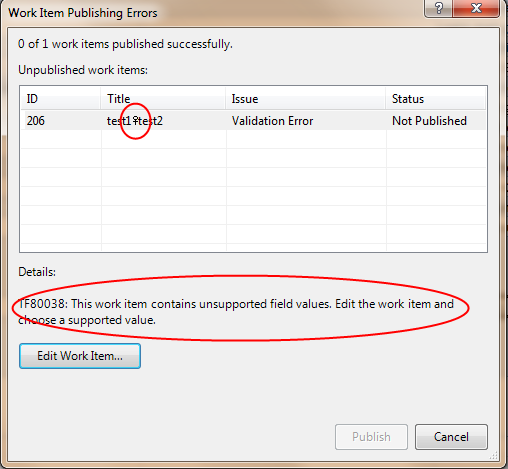 One of the issues one might run into when importing Work Items into TFS 2010 using the Excel Add-in is the Excel limits. One of the most important limits is the cell contents limit. When importing from another system, this limit might be exceeded, resulting in truncated text. Excel does not warn when the length of the pasted text exceeds this limit. So it is necessary to identify this issue in the source. Excel 2003, 2007 and 2010 have a 32,767 character limit per cell. 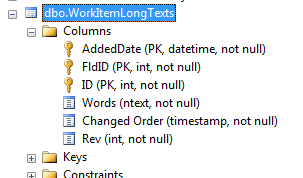 TFS stores PlainText fields in a table called WorkItemLongTexts. This is part 1 of the series about importing Work Items into TFS 2010 using the Excel Add-in. For more information about the Excel Add-in for TFS, check out http://msdn.microsoft.com/en-us/library/dd286627.aspx. Using Excel is a very convenient way to import Work Items into TFS. It’s fast and flexible and most people know how to use it! There are however some pitfalls one needs to consider. This series will describe some of them. When configuring a Work Item Type, a choice can be made between a “Plain Text” field and an “Html” field. The difference is clear; Plain Text can only contain text whereas the “Html” field can contain markup as well. Having the possibility to add markup to your text is of course a nice feature. There is however a downside to this when cooperating with Excel; You cannot edit Html type fields. It’s only possible to initially fill them when creating the work item in Excel. So be conscious when using Html fields!